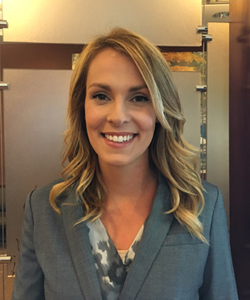 Dr. Savannah Brunt provides comprehensive and compassionate care for patients with a broad spectrum of ocular diseases including, glaucoma, dry eye, and ocular surface disease. After earning her doctorate at Southern College of Optometry, Dr. Brunt completed residency training in ocular disease and surgical co-management at Bascom Palmer Eye Institute, consistently ranked as the number one eye hospital in the United States. She is a member of the American Optometric Association and the Colorado Optometric Association. Dr. Brunt grew up in West Virginia, which cultivated her love for the great outdoors. She loves living in Colorado due to the state’s natural beauty and the infinite outdoor adventures it has to offer. She is an avid hiker and has a passion for traveling and experiencing new cultures. Her love of travel and patient care has led her to serve on multiple mission trips to provide eye care throughout Central America.